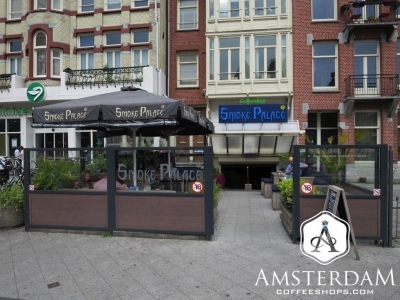 Smoke Palace coffeeshop is located on Linnaeusstraat, in the Dapperbuurt neighborhood of East Amsterdam. This is just a beautiful corner of the city. It is a bit away from the center so it is less crowded, and mostly residential. Tree-lined streets and beautiful historic architecture define the area. 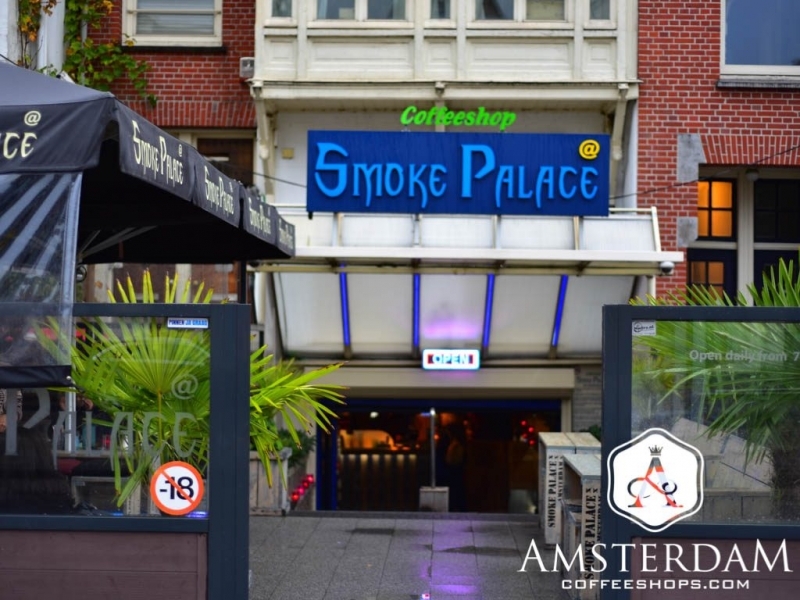 Even better, Smoke Palace sits right next to Oosterpark (“East Park”). This is a shady serene oasis we highly recommend you consider taking a stroll through. 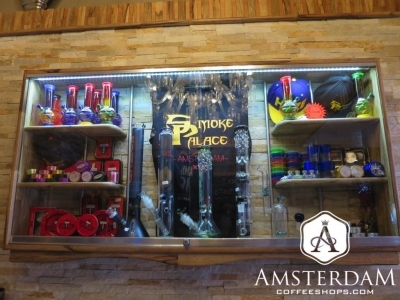 We will begin by pointing out that Smoke Palace is among the largest and more luxurious coffeeshops in the city. 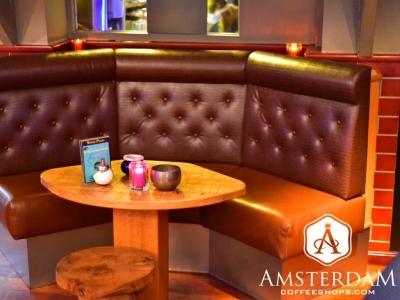 Before even getting inside you will notice a large section of outdoor seating. This alone has the amount of seating found at most coffeeshops. 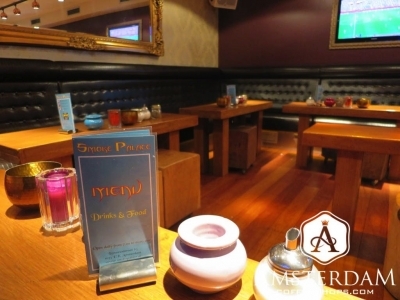 The area is separated from the street by a partition so it does feel intimate. 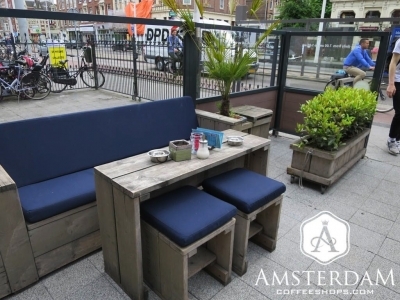 It is also packed with plants, wooden crate-style bench seating, and umbrellas to provide shade. It almost feels beachside. On a beautiful sunny day, this spot is hard to beat. As you step down to enter Smoke Palace, you find an equally impressive interior. The shop is large, and clearly, a great deal of time and thought was spent on the décor. Custom tile and woodwork are featured on the walls and counter throughout much of the shop. The flooring in the main lounge area is beautiful, polished hardwood. The tables and modern stools add a contemporary element. 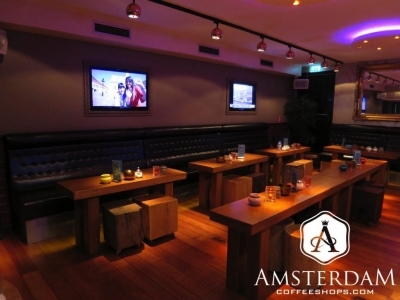 Tie in some mirrors and track lighting, and you have a place that looks much more like a nightclub than a coffeeshop. 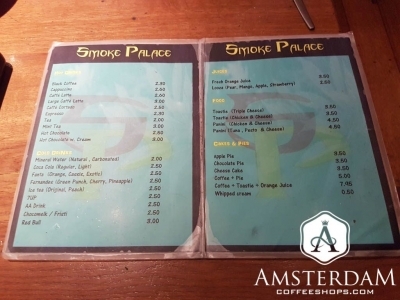 The cannabis menu at the Palace is moderate-to-large in size. It tends to favor the weed (flower) side with regard to diversity. They may have about a dozen strains here, often a mix of recognized favorites and new genetics. The hashish menu tends to be smaller, though still formidable compared to many shops. They also have a large selection of pre-rolled joints. In addition, this is a full-service shop. 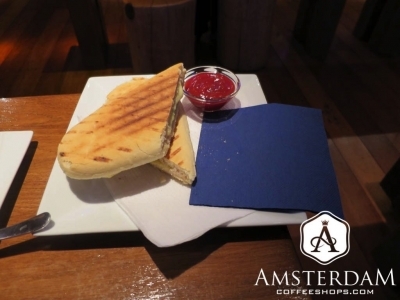 A wide array of coffees, teas, sodas and other drinks, snacks, and even a few quick hot foods are available for order. This shop is not only inviting, but has plenty to offer to keep you comfortable if you plan on parking yourself here for a while.